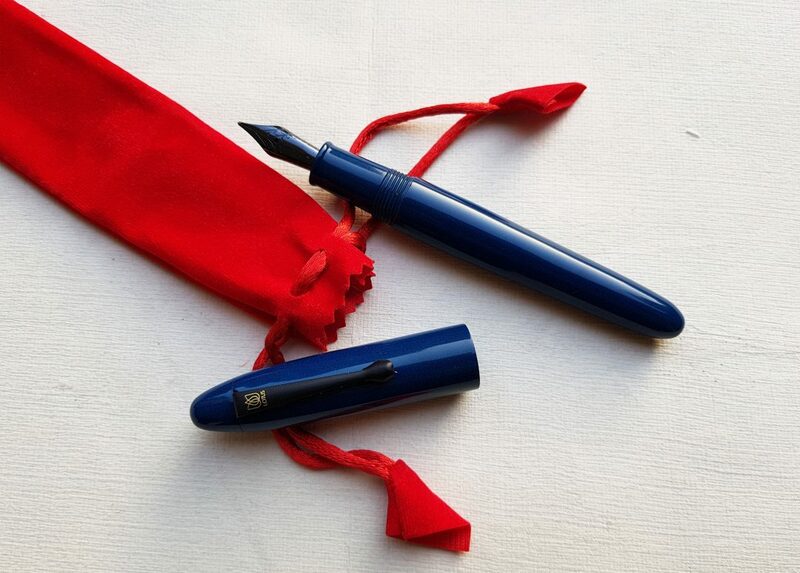 The pen that I am reviewing or we will be discussing about is one of the sleeker version of the Wality/Airmail pens and is named as WALITY 70AM or AIRMAIL 70AM. (A = Acrylic and M = Medium). 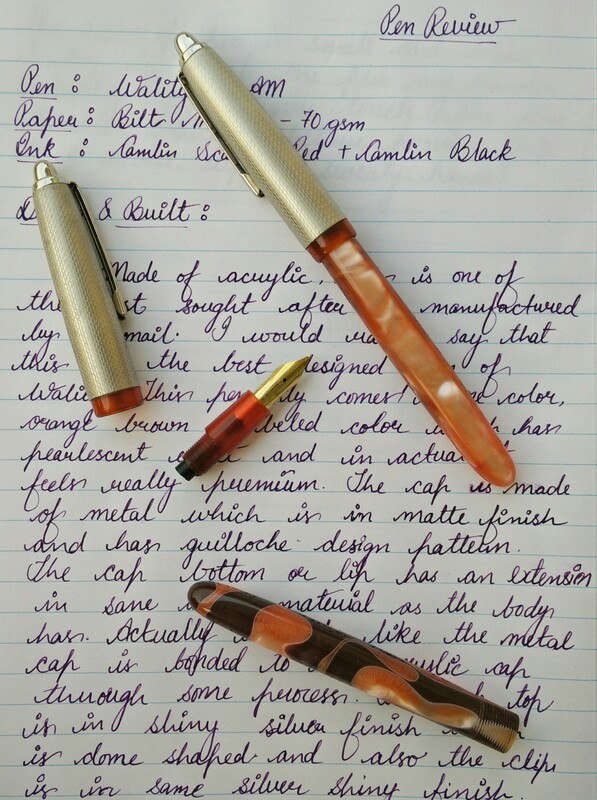 Made out of premium acrylic in brownish orange marbled and swirled finish, this is one of the best designed pen Wality pen. And it comes only in one color and that is orange brown swirls with pearlescent effect and in actual it feels really premium. The cap is made of metal in silver color and has guilloche design pattern in matte finish. 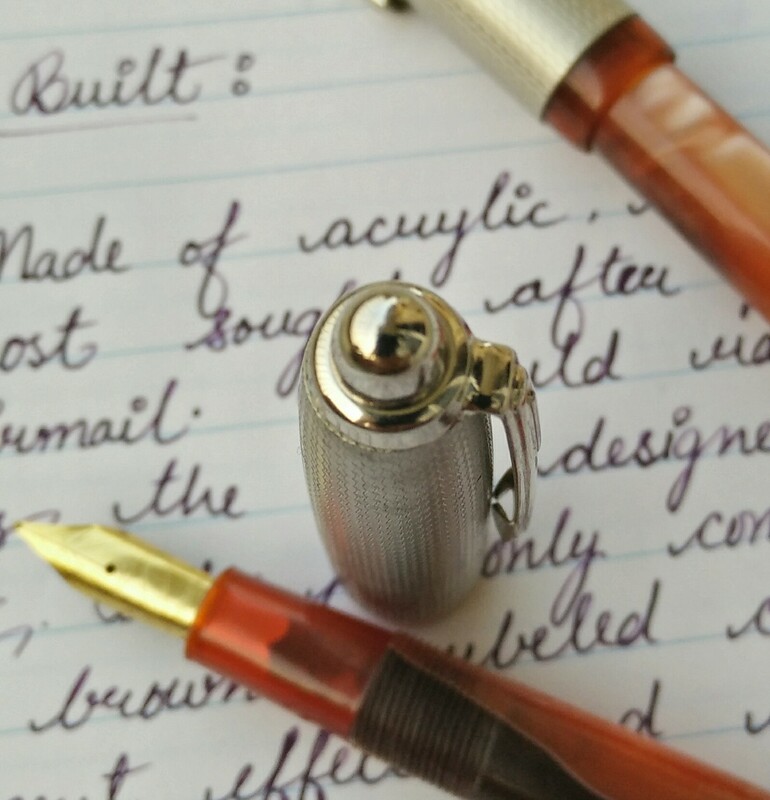 The cap bottom or the lip has an extension which is made of the same acrylic material of which the pen is made of. 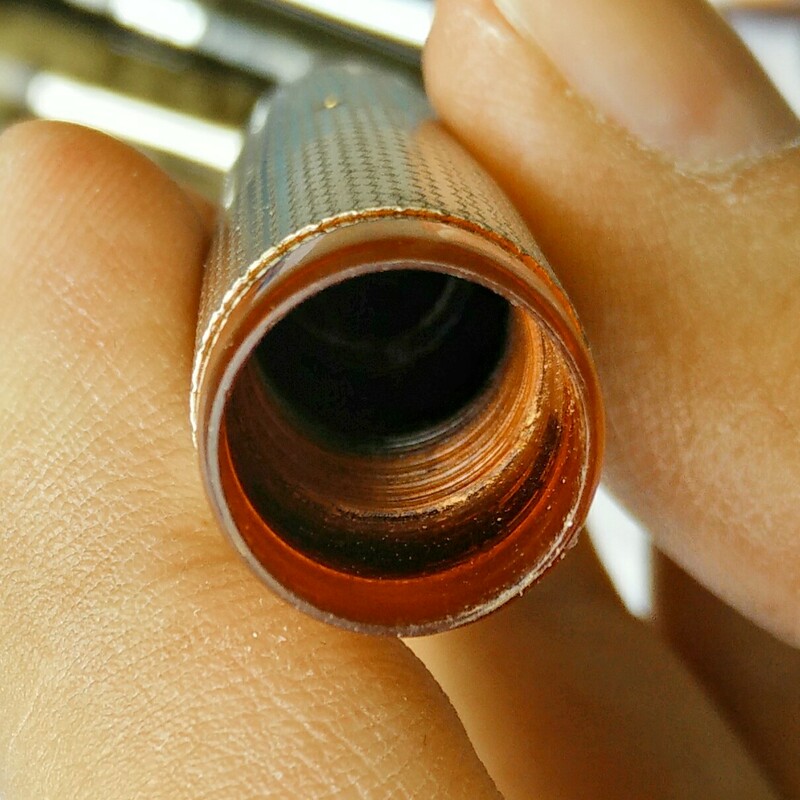 Actually it seems the metal cap is bonded to the acrylic cap through some process. The cap top is in shiny chrome finish which is in dome shape. and even the clip is in shiny chrome finish. The pen clip is sturdy and stiff and will fit even shirt pockets and not slide. 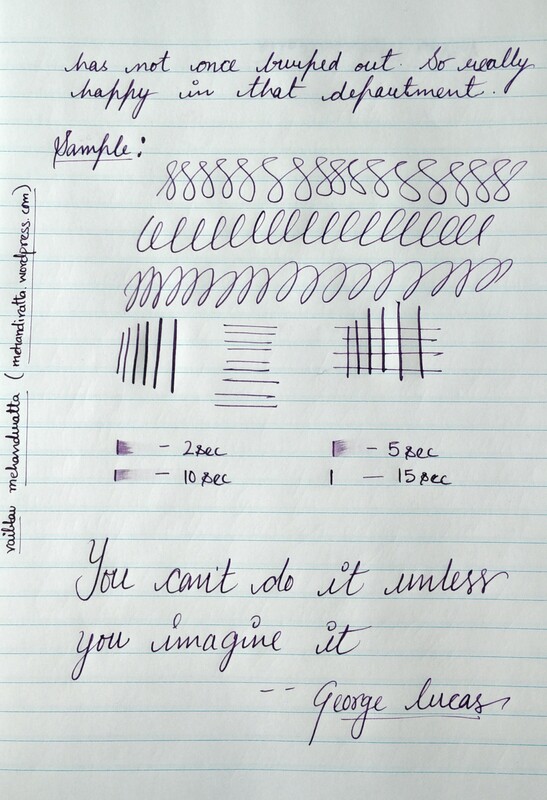 The section of the pen is small and when i try to hold the pen in my hands my fingers touches the threads which actually are smooth and not that sharp and they actually provide the grip to otherwise slippery hands. 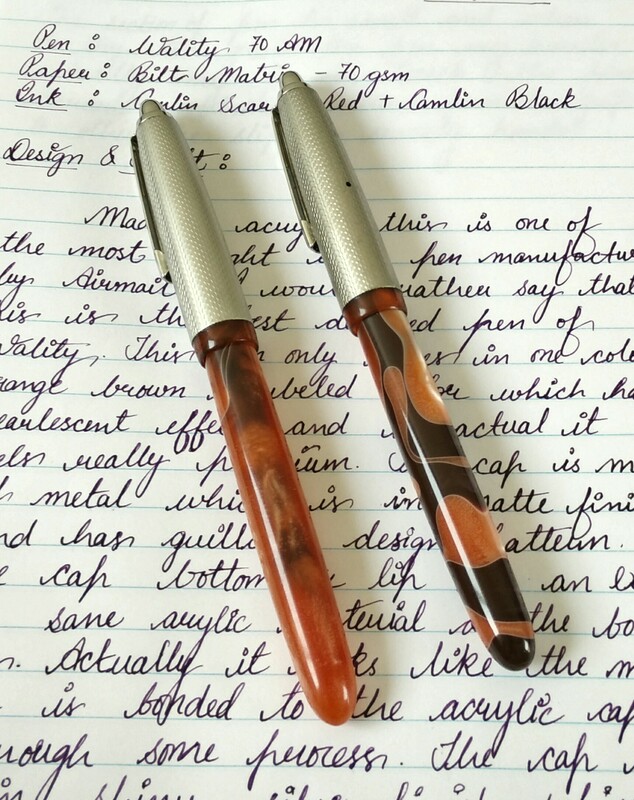 The pen easily opens in 1 and 1/2 turns which actually is not seen in Indian handmade ebonite pens. 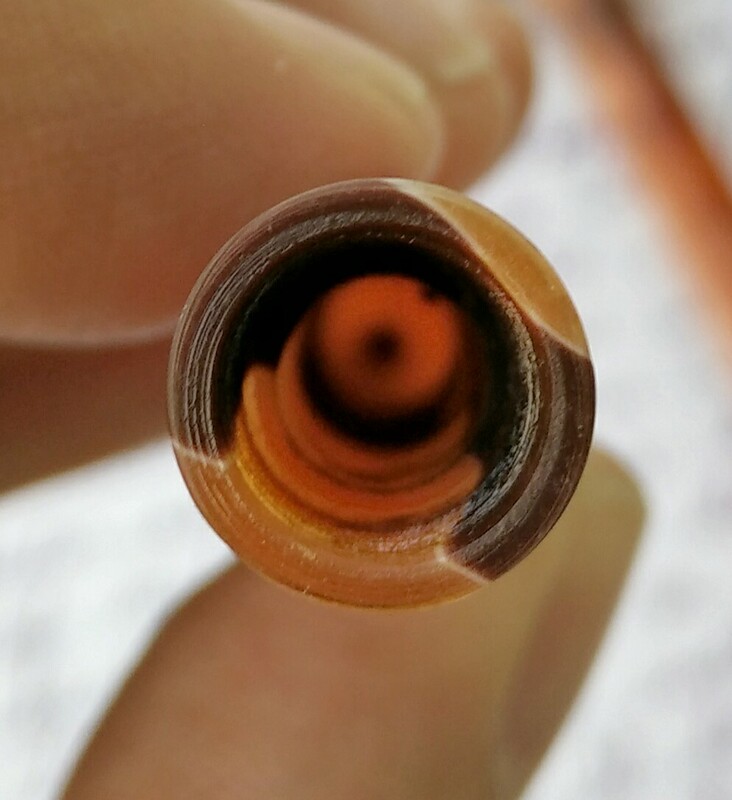 The pen actually tapers from lower half of the barrel towards the section gradually. Its slender well-built pen. 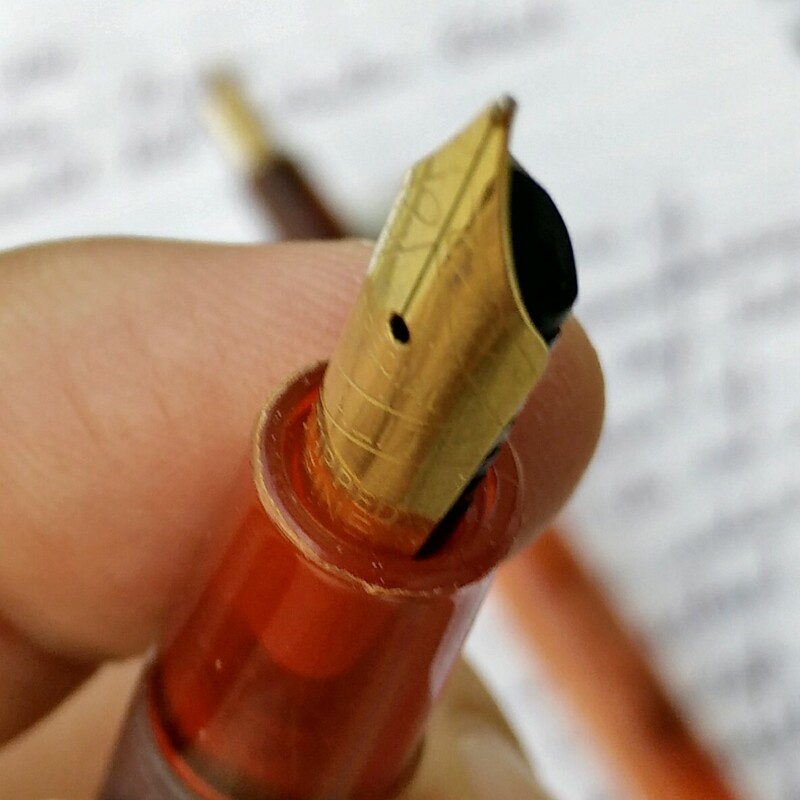 The built quality of pen is far above acceptable, the only glitch remains is the Nib and the feed placement and alignment which we will be discussing later in “Nib and Ink Filling Mechanism” section later. 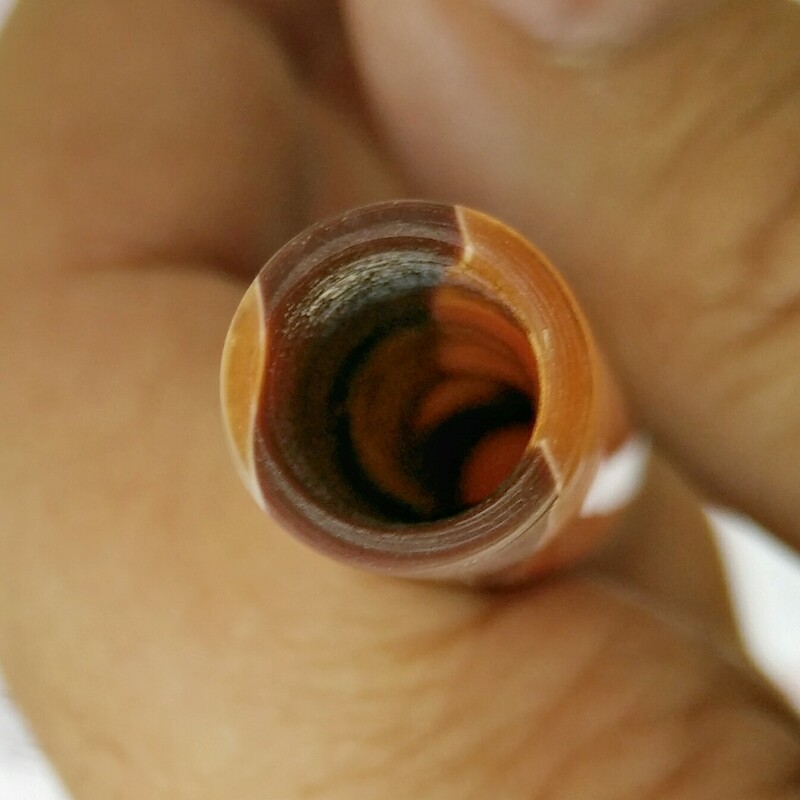 As you can see in the image below the thickness of the acrylic in the barrel, its evident the quality is okay. 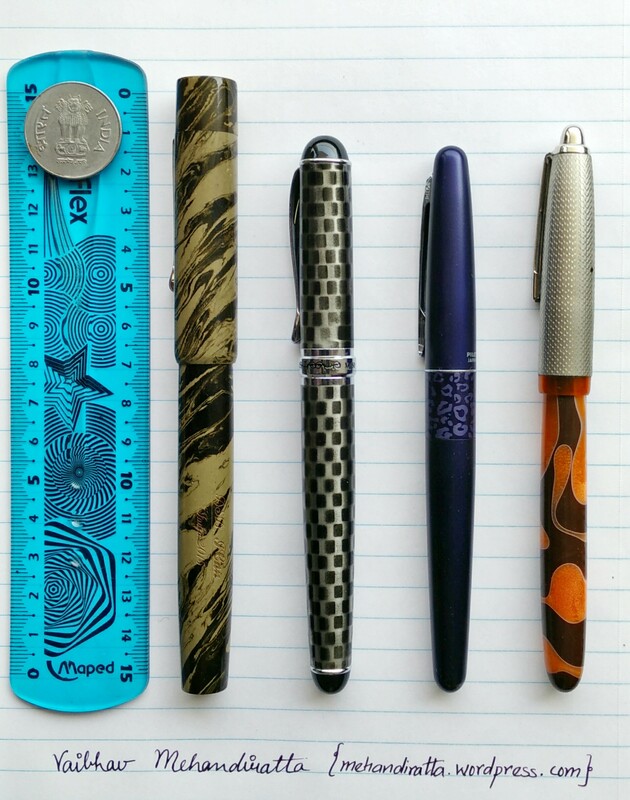 Below are the few images which shows the comparison with few other pens to get the idea for size of pen. The pen is well built and well designed just one or two quality finishes you might encounter which are not noticeable to human naked eye. 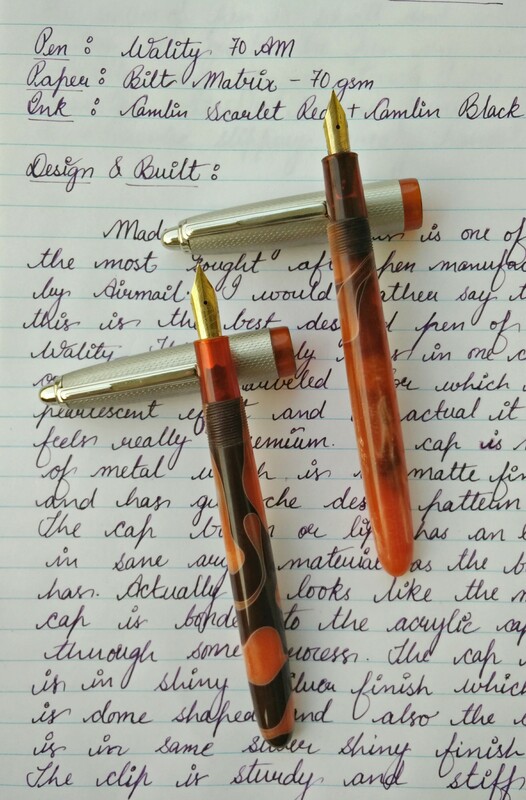 The pen is approx 140 mm when capped and 120 mm when uncapped including nib. And posted the length is 170 mm, which makes it fairly large. The pen unposted is apt for small or medium size hands, however, people with fairly large hands might want to write with the cap posted at back. The cap posting makes it slightly unbalanced even though the cap posts securely at back. Since its metal cap whole lot of weight goes to the cap and posting puts all the weight at the back, thus it becomes a bit unbalanced. Otherwise, it is a perfectly balanced pen for writing unposted. 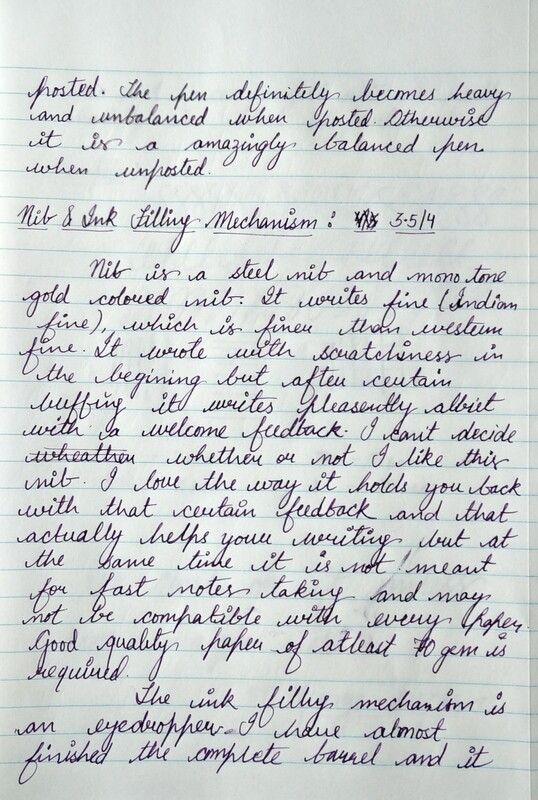 Nib that comes with the pen is monotone gold colored steel nib which writes Indian fine (finer that western fine). 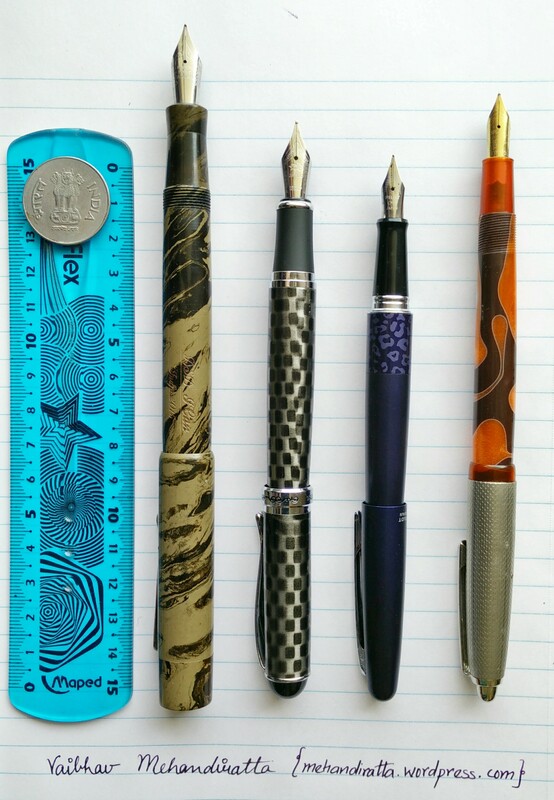 Its always a love and hate relationship with the Wality pens you either love them or hate them, but mostly you want to love them. You will probably sometimes hate them will be just because of nibs. Their nibs are bit of hit and miss. 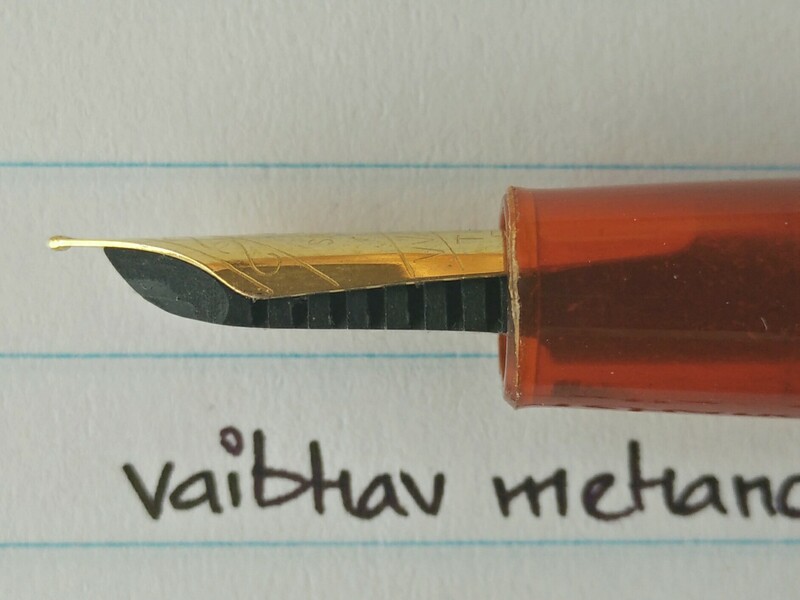 The fine nib that cam with this pen wrote with certain scratchiness and its a hard nib, no flex, no semi flex, but after certain buffing it writes pleasantly albeit with a welcome feedback. Please note that you will love this feedback. 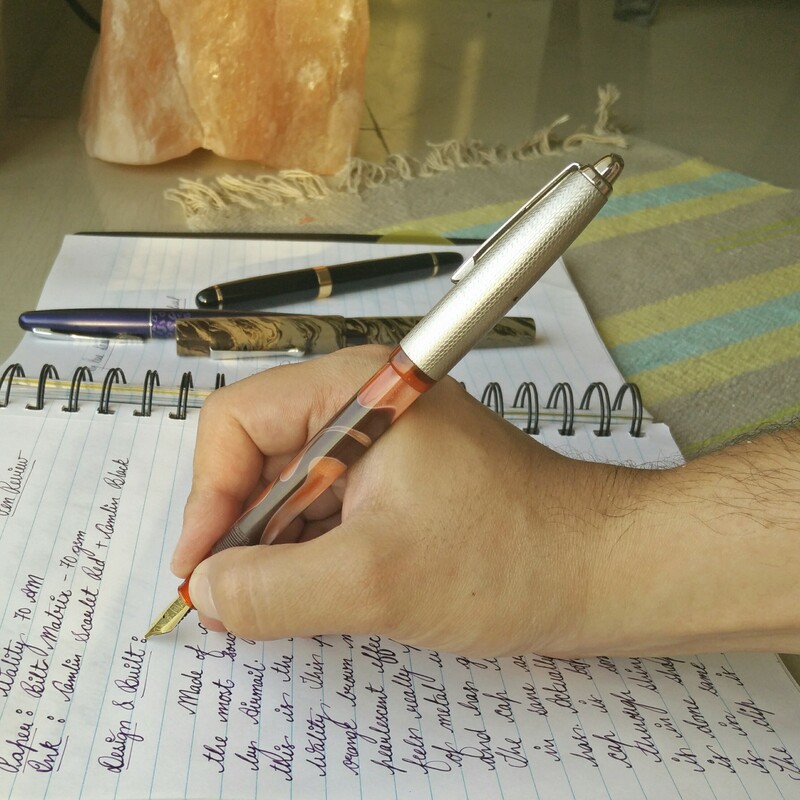 I love the way this nib holds my writing which actually helps you in slowing down and gives your writing some depth. I will recommend this to people who want to improve their hand writing, it doesn’t glide away so that you don’t have control to hand while writing. I love it because it helps you slow down without being scratchy but at the same time this pen is not meant for fast notes taking or something like that. 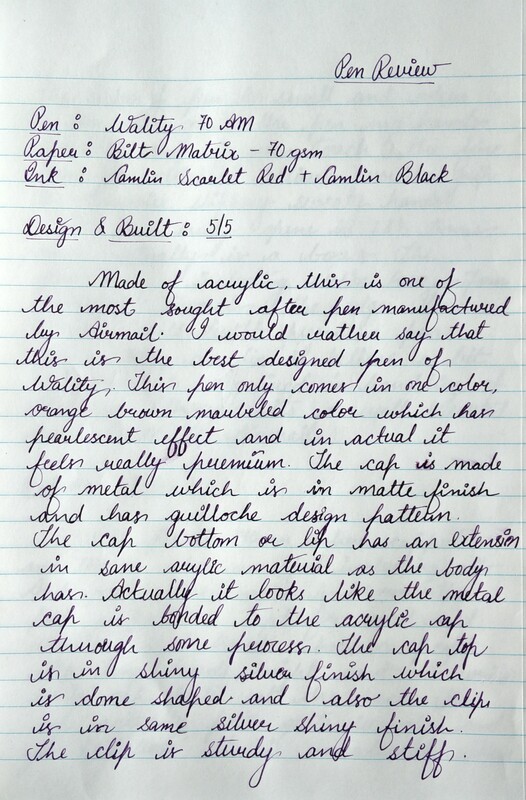 Good quality paper of minimum 70 gsm is recommended to be used with this pen. The ink filling mechanism of the pen is through eyedropper. 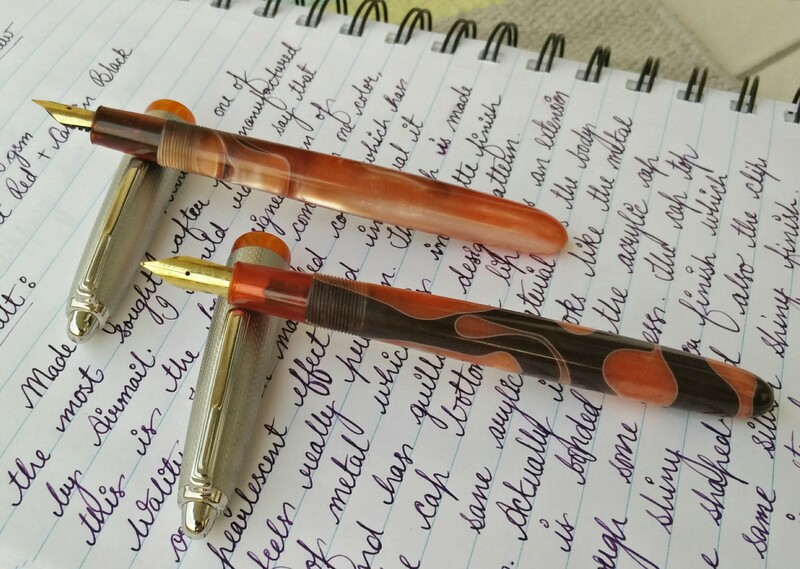 While writing hand written review I finished the entire barrel and it never burped or spilled ink even once. So I am really satisfied in that department. 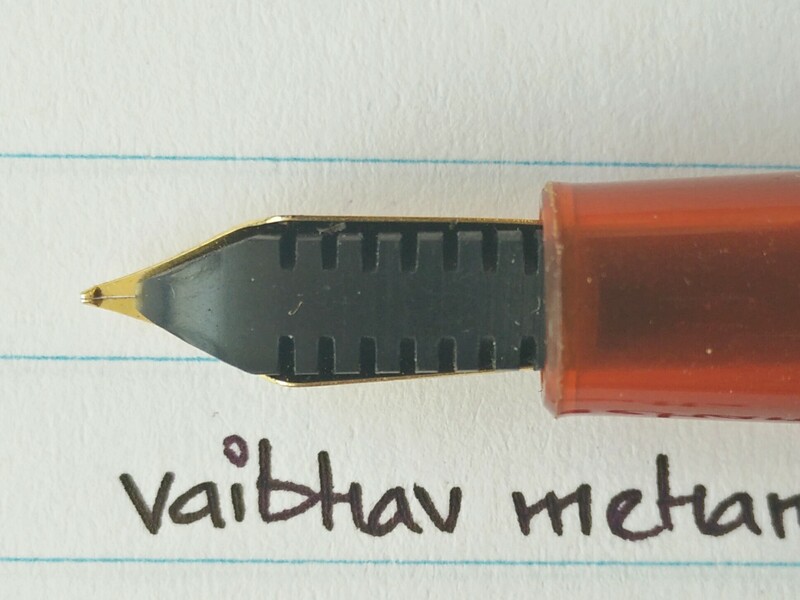 The pen barrel holds approx 2.5 to 3 ml of ink which I think is a good quantity of ink. You can easily take out the nib and feed and disassemble the pen. Its very easy. Also i would have preferred if the nib would have been either in chrome finish or dual tone to match with the cap metal color. 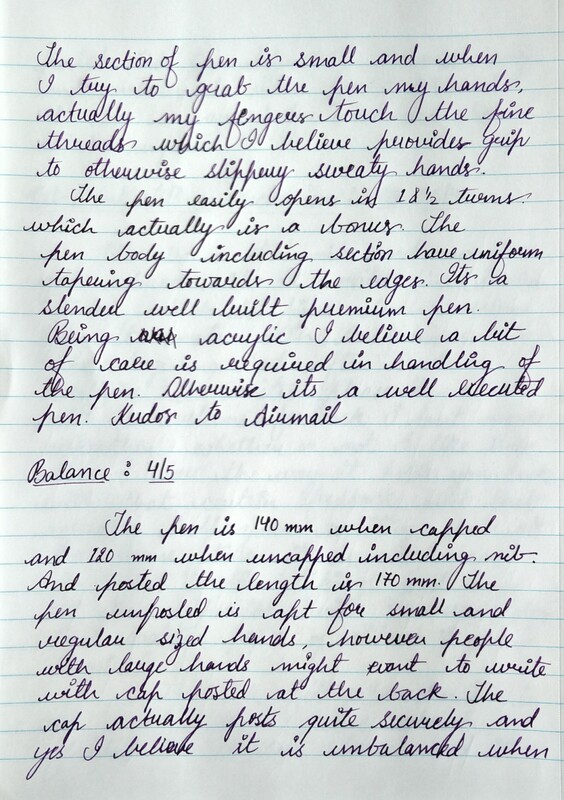 Below is the detailed handwritten review of the pen for writing sample. Its a good buy @ Rs. 235/- plus shipping. 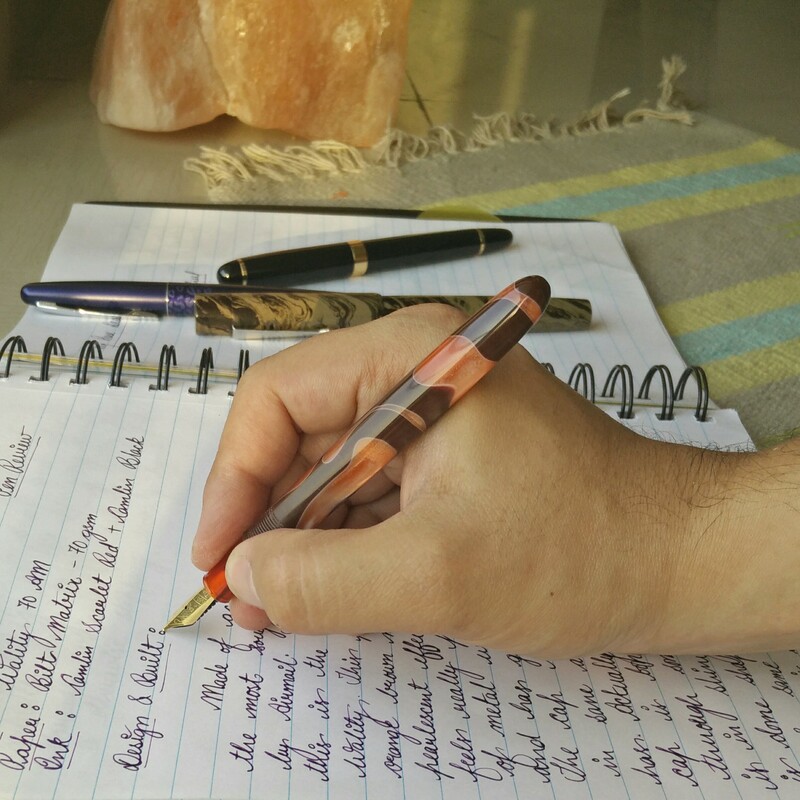 I would recommend it to acrylic pen lovers and people who want to sit and relax and write and also to people who want to pay attention to their writing. Hi Vaibhav, great collection there and some real beauties also. I wonder where you source them. I live in Bangalore and it seems such pens are no more manufactured. I did not do a thorough search though. Do you buy them on the internet? 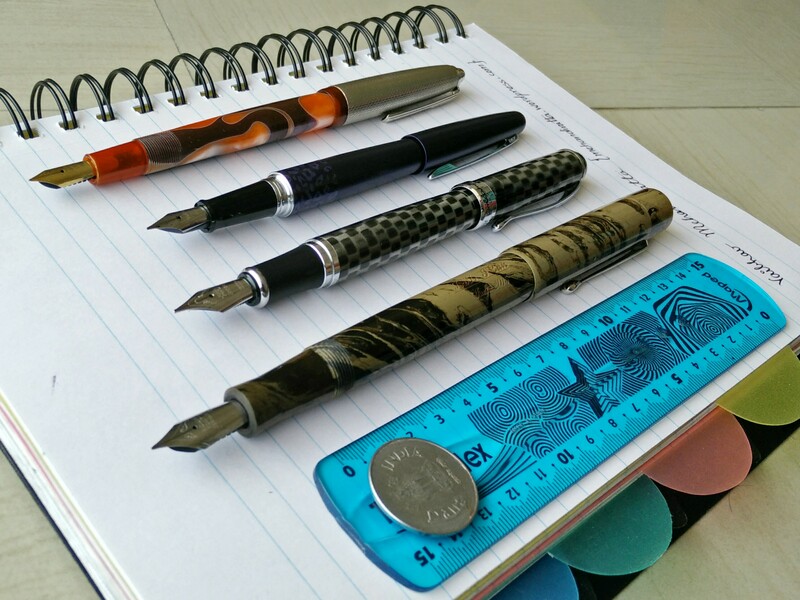 I tried Flipkart etc but only get Lamy, Parker and those kind of high end models. Could you help me please. As always, a great review! 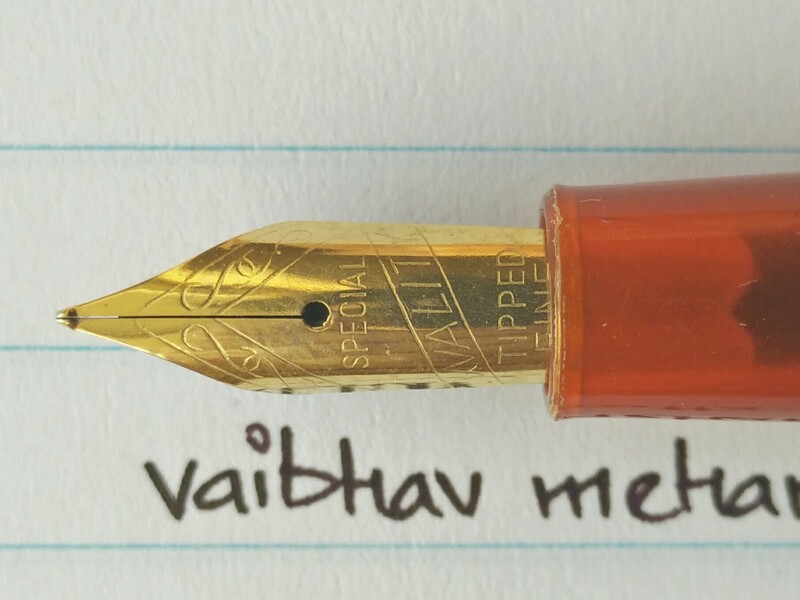 What did you use for buffing this nib, Vaibhav? What “nib buffing video” would you recommend to someone who’s never done nib work before? Thanks in advance! Vaibhav, I liked the review and pics you posted. I like most of the airmail pens this pen is not an exception. Once again all praises for your good work.